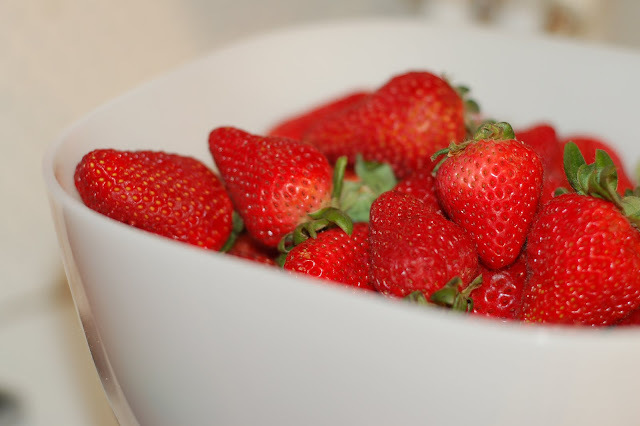 I have been loving strawberries these days. Health benefits aside they're just good. I remember reading something somewhere that they naturally clean your teeth. I've been buying them and eating them before Benjamin gets any. I don't think he even knows they're in the fridge. 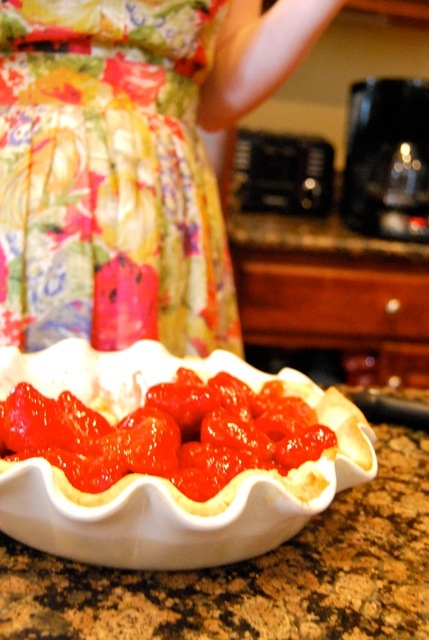 For Easter I knew I wanted to make Strawberry Pie. I'd made one before but was super excited that Cook's Illustrated came with their recipe inside. As I've said before, a winner for sure. This got all the rave reviews I was hoping for - sweet, but not too sweet. 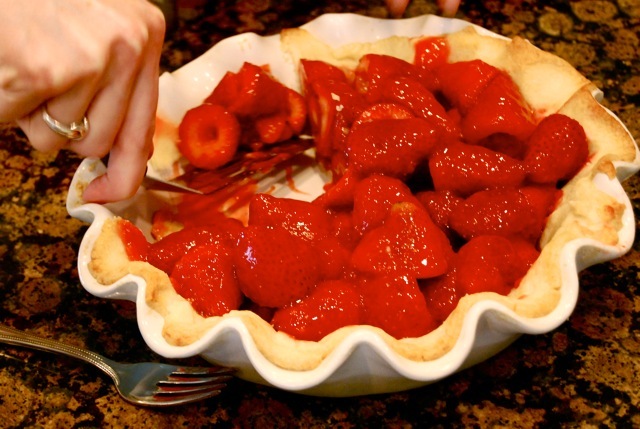 It's the perfect pie to make when you have awesome berries. Sometimes when you have an awesome fresh fruit you're not sure what to do. Often times the best thing is to just eat it fresh so it doesn't get lost in a recipe. 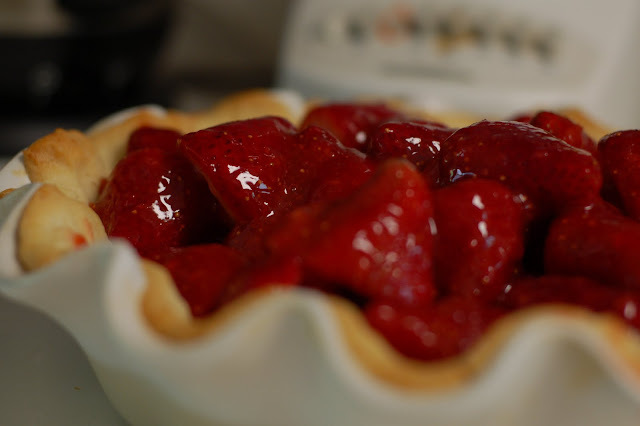 If you have fresh sweet strawberries I'd make this pie. You make the jelly yourself and there isn't too much sugar to overpower their natural sweetness. When can I make this next? 1. I made a pie crust according to the package directions. You can make pie crust if you'd like, but pie crust and I aren't friends yet so I opted for the pre-made kind I had in my freezer. 2. Select 6 ounces of the unattractive berries, having those that are too large, and measuring about 1 1/2 cups. 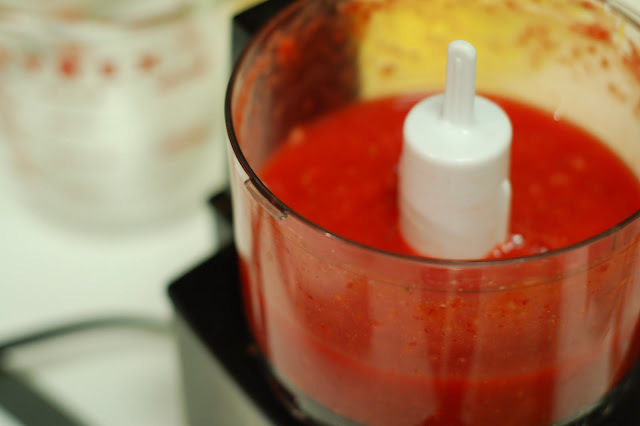 Process the berries in a food processor until smooth. You should have 3/4 cup of puree. 3. Whisk sugar, cornstarch, sure-jell, and salt in a medium saucepan. Stir in the puree scarping down the corners of the pan. Stir constantly and when it boils continue stirring for 2 minutes then remove from the heat. Pour the jelly into a bowl and let it cool to room temperature. 4. Take your remaining berries and hull them. Half the large ones but otherwise try to keep whole berries. When the jelly is at room temperature mix it with the berries then pour everything into the pie shell. Chill for at least 2 hours and up to 5. Note: I made everything the night before I was serving this. I assembled the pie the morning of Easter knowing it wouldn't be enjoyed until later that afternoon and it was fine! I think you can assemble it the night before too and no one will be upset because it's just that good. This looks delicious! I am so happy that strawberry season has officially arrived. me too! I still can't get enough of them! Lizzy & Beth- I hope you make it soon! I want to make it AGAIN soon!